Considering buying real estate in Oakland’s Upper Rockridge area? With gorgeous estates dotting the hills above a popular commercial district, Upper Rockridge is one of the most coveted neighborhoods in the East Bay. It’s close to everything and yet much quieter than Lower Rockridge. Here in Upper Rockridge, home values remain stable and Chabot Elementary and Hillcrest School are among the best the Oakland school system has to offer. With its close proximity to restaurants, shopping and public transportation, it’s no wonder that the East Bay considers Upper Rockridge a great place to call home. Upper Rockridge is located in the Oakland Hills south of Highway 24 and below Highway 13. This affluent neighborhood runs above Broadway and wraps around the top of the Mountain View Cemetery and the Claremont Country Club. The views are spectacular- whether of the Bay or the neighborhood itself. Rockridge residents are justifiably proud of their neighborhood. Upper Rockridge is considered the gem of the East Bay, one of the most coveted places to buy a home. Residents enjoy the public pathways that run throughout the area, which is hilly but not too steep. These trails offer you a quick way to get some exercise, as well as a great way to experience your neighborhood from a unique perspective. Upper Rockridge residents are only minutes from the popular Rockridge Shopping District along College Avenue as well as the small town pleasures of Montclair Village. For other, everyday items, most residents stop by The Village Market, a charming grocery store at the intersection of Broadway Terrace and Clarewood Drive. After the 1991 Oakland Hills Fire Storm, some of the area’s premier architects and builders went to work on Upper Rockridge. This blank canvas allowed them to create grand scale homes with unmatched views of San Francisco, Golden Gate Bridge Mt. Tamalpais and the Pacific Ocean beyond. Upper Rockridge has homes and lot sizes that tend to be more spacious than those of lower Rockridge. Home prices in Upper Rockridge range from $800’s to $2 million and up. 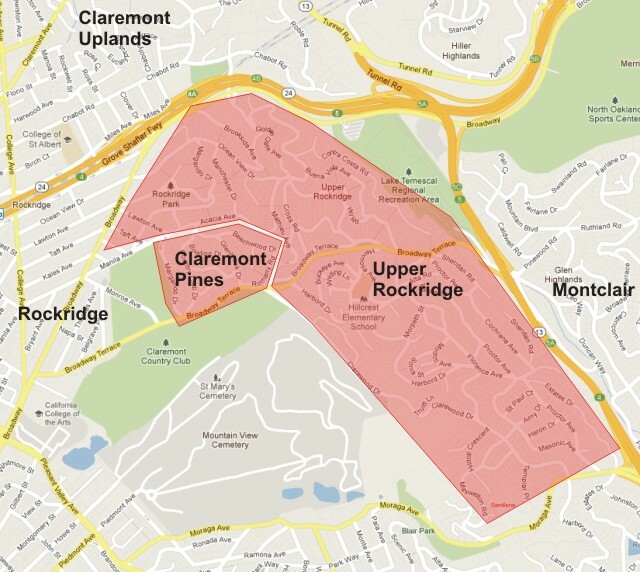 Does the Upper Rockridge area sound like your new home? Contact Brian Santilena for more information about real estate in Upper Rockridge and other Oakland neighborhoods. This entry was posted on Friday, October 19th, 2012 at 1:31 pm	and is filed under . You can follow any responses to this entry through the RSS 2.0 feed. You can leave a response, or trackback from your own site. Interested in properties for sale? Have a real estate question? Fill out this form and I'll be in touch with you asap! Brian.